"In the cool of the evening the greatest man of his time would sit and discuss with his companions the events of the day. This would often be the occasion for him to tell a story about his adventures in other lifetimes. 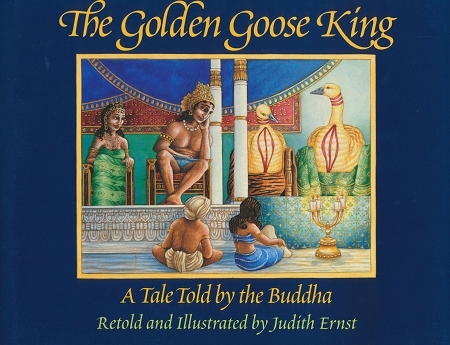 For all creatures Gotama the Buddha had come " So begins the introduction for one of those stories, The Golden Goose King, in which the Buddha is a magnificent golden goose, the king of a flock of 94,000 geese dwelling near the city of Benares. The Queen of Benares has a dream in which she converses with a beautiful and wise golden goose. Upon waking she realizes that it was only a dream, and yet it was so vivid that she longs to see such a goose in the flesh. This ardent wish propels the story through various episodes to its ultimate conclusion, illustrating the virtues of love, loyalty, and self-sacrifice. This is a lovely story, simply told, which introduces young people to Buddhism and ancient India. But The Golden Goose King is more than a book for young readers. It is retold here with fidelity to its earliest versions, preserving its essentially Buddhist flavor, conveying both with its text and its glowing paintings the original charm and depth of this Jataka tale. It is truly one of those rare books to be enjoyed by people of all ages.